I love coordinated family holiday pajamas! Do you remember this Christmas family post from last year? Melt my heart – my kids have grown so much but they’re still wearing those monogramed robes. If you follow me in Instagram or Facebook you might have noticed I start my Christmas decorating on November 1. I also bring out the holiday pajamas around the same time and I want to encourage you to at least start shopping for them. In years past I have tried to get matching family Christmas pajamas in December and more than one person’s size is sold out. 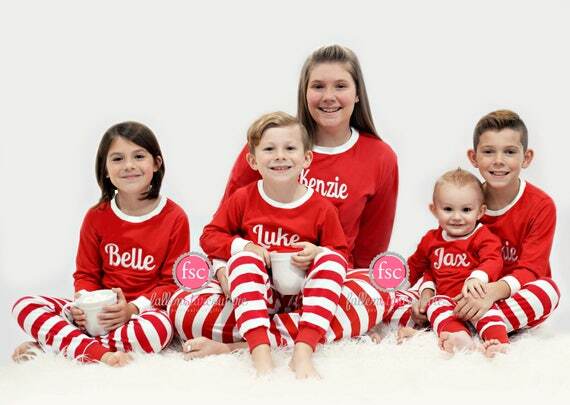 So I have rounded up some holiday pajamas for you and the fam below! Some are more subtle than others but they all make for great family photos. The pajamas I am wearing above are a couple year’s old from H&M (only $25). They still make almost the same pair – I’d recommend sizing up in these pajamas. The Hanna Anderson site has a wide selection of more sophisticated (for lack of a better word) holiday pajamas for all ages. A lot of ETSY sellers will also let you pre-order and personalize your pajamas. Old Navy, Target, and Kohl’s all have affordable options if you shop REALLY early! Believe me friends – the popular sizes go fast!! Quick Family Dinners to Try This Week! I agree with getting them early! I ordered pj’s for my whole family from Children’s Place almost a whole month ago!!! The total for all four was under $50, which was a steal, because last year, I ordered from Hanna Anderson. Although very cute, spending $200 for pj’s was a bit cray cray! I’m glad I got on the ball early this year- no last minute stressing and save money! Now mom has more $$$ to buy all of your cute outfits!!! I agree – I don’t splurge on high end family pj’s either. I hope you get what’s on your holiday wishlist! !